2.1 Did Israel poison Sergei Skripal? 4 Did Syrian air defenses hit thin air? Likely route of coordinated U.S. and ISIS attacks. Russia, Turkey and the United States have come to a tacit agreement that the final settlement of the Syrian civil war will include population transfers, where isolated problem populations are "ethnically cleansed" and moved to larger, economically and logistically more viable larger enclaves. The relationship of these "cantons" to each other and to the Syrian state will be a matter for the political peace negotiations. Everything east of the Euphrates, including the eastern bank of Deir ez-Zor. The oilfields east of Deir ez-Zor. Al Tanf border crossing and surrounding area on the main road from Damascus to Baghdad. The Daraa border crossing, just south of Daraa. Several key places are held by ISIS, possibly with the tacit support of USA. East bank of the Euphrates south of Deir ez-Zor. It is claimed that the reason the U.S. needs to occupy the Al Tanf border crossing is to block the land corridor between Iran and Lebanon and thus prevent Iran from supplying Hezbollah. The real reason may be different. If pro-U.S. and pro Israel forces managed to take control of the Syrian side of the Jordan–Syria and the Iraq–Syria borders then it would enable Israel to supply a Kurdish protectorate in eastern Syria. The area from the rebel enclave around Daraa to Abu Kemal on the Euphrates is mainly desert. If pipelines could be built on this strip of land then Israel could steal oil from "Kurdish" oilfields and even water from the Euphrates. The United States may be about to start a land invasion of Syria. 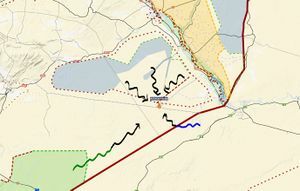 The offensive would start from the U.S. base at the Al Tanf border crossing and extend through Abu Kemal to the American and Kurdish-held areas on the eastern bank of the Euphrates. The troops would be supplied through Jordan. It is possible that Britain would also take part in this operation. The 2,400 man strong U.S. 26th Marine Expeditionary Unit arrived in Haifa in Israel on March 14, 2018 aboard the three US Navy ships of the Iwo Jima amphibious ready group. The Marines may be on their way to the Al Tanf base through Jordan. Another 200 U.S. troops are said to have arrived in Al Tanf the previous week. Unconfirmed rumors claim that an additional 2,300 British troops also arrived at the base along with Challenger tanks and Cobra and Black Hawk helicopters. The attack would start with with a massive cruise missile launch on Damascus from NATO warships. The ships are said to be assembling in the eastern Mediterranean, the Persian Gulf and the Red Sea. Russia has promised to retaliate against any ships launching missiles at Syria. This warning was first stated by the Russian General Staff on March 13 and again on March 17. The missile attack would however be only the first part of a NATO attack. It would be quickly followed by a land invasion from Al Tanf. As I am writing this, I hear talk of even larger attack plans. Attacks by the U.S. and U.S. proxies have the tendency to coincide with ISIS attacks in the same area. ISIS has recently launched massive attacks along the Euphrates river and more may be planned. Any Western aggression on Syria would have to be preceded by a false-flag provocation by Syrian opposition forces. Britain pays lip service to international law and it could not launch a war of aggression without an effective propaganda campaign. Russia claims to have information that a staged chemical weapons attack is being prepared. The March 17th warning specifically says that the preparations are happening in southern Syria near the Jordanian border under U.S. supervision. It now seems evident that to real reason for the poisoning of Sergei Skripal‎ was to drum up British support for a war against Syria and Russia. One must must thus ask who would most gains from such a war. If the above analysis is correct, then the answer would be Israel. Did Israel poison Sergei Skripal? Israel has a long history of assassinations abroad. Israel is not a OPCW member and has an active CW program. Mossad can preform hostile actions in Britain and still be counted as friendlies. If they got caught in the act, they would simply be deported in secrecy. There are similarities the Skripal poisoning and the 1997 poisoning of Khaled Mashal in Jordan. The poison used may be the same fentanyl based mixture. Netanyahu is the current prime minister of Israel. He also ordered the 1997 assassination attempt on Mashal. The thing that really made me suspect Israel was the claim by Boris Johnson that Russia has a secret program that develops novichok type chemical weapons for assassinations. It is most likely true that Russian laboratories have been working on novichoks, like all major weapons laboratories in the West. The part about assassinations is disinformation. US is not in the mind set of unnecessary adventures. It is busy with domestic agenda and well-defined threats (Korea, Iran). It is managed in a business manner, investment-profit (or intuitively defined domestic value). Using US army to capture and run oil fields in badlands is not a very profitable business, compared to alternatives like investing in infrastructure or military technologies in USA (but not in the military quagmires). Skripal may be slower and more subtle approach, basically to wrong-foot Russia enough so that Russia-free OPCW is put in place, and used for whatever geopolitical leveraging is desired. Like an extended version of Olympics,- Russians probably did some wrong things in sports (or whatever, I am not into that)--but the penalty applied was far greater than the crime, with top athletes with no violations and on track for gold banned in troves, with remaining ones weakened and white-flagged . Similarly here, even if Skripal is a crude false flag, some wrongs can be found, or claimed, and a big profit made out of it. The fact that British did not want to share samples with Russia, but shared with OPCW, points toward such scenario. That was claimed by Mirzayanov in one of his writings, that there was a parallel CW program by the services in USSR/Russia. Параллельно это разрабатывало КГБ, ФСБ. (KGB, FSB developed that in parallel-Mirzayanov). And I think the whole point of a false flag, if such, is to use smth traceable to Russia, not to use another poison; a number of countries/labs could do it; research quantity under 100 g does not fall under the convention. Did Syrian air defenses hit thin air? It is possible, that Syrian air defenses wasted 112 missiles firing at imaginary targets created by radar jaming and electronic countermeasures. To argue otherwise we would need to see photos of the downed missiles. So far we have seen nothing but fakes, with the exception of a few missile parts that might have come from a missile that hits its target. We know for a fact that anti-aircraft missiles were fired during the FUKUS attack. @WaelAlRussi on Twitter shows empty missile canisters from a Pantsir-S1/2 system. It may be that the airbases were targeted only because they have the strongest point defense systems that would be the first to react to the electronic warfare. There was another phantom attack on the night between the 16th and 17th of April, evidently launched by Israel. First the target was the T4 airbase. Then Al Shayrat then Dumayr. Then all of them. Then none of them. Russia says the whole attack was a false alarm. But evidently the ghost missiles managed to hit the Dumayr airbase twice. Who knows? Some points. Technical. (1) Western claim; Syrian air defense missiles were fired after all targets were hit. (2) Satellite photo from the 3 declared targets (eg here) do not support an attack by 105 missiles, at least with standard explosive warheads (3) there are some videos showing missile explosions in night sky, which would be consistent with successful intercepts, but not a proof of it ( could be hitting decoy targets, or self-destruct). One such video embedded here (Russ. opposition flavor & highly critical of Russia/Syria) and there are several different such videos on youtube, 1, 2, etc (4) Two unexploded/well preserved Western missiles were found, said to be transferred to Russia; details not provided (5) there's a speculation that new cruise missiles were EMP pulse ones. However, eg Buks are tank platform based, electronics inside will be screened, and it will be a bit like a shot against modern gadgetry like cell phones/ipads/etc. There is no particular evidence that air defenses were affected by EMP (although there was an apparent air defenses false alarm shortly after, somehow). (6) Perhaps missiles were not shot but deflected by radio-electronic warfare; but no specific evidence for that. There is no proof that any military airports were actually targeted by the missile strike. Instead, the numbers may simply be the score card for the air defense units on each military airport. The numbers for the Barzah research center may come from recording the blasts from online and webcam videos. Most likely each air defense unit used only one or only a few different types of missiles. The BUK unit at Al-Dumayr Military Airport claimed 12 hits. This would be the full missile load of 2 BUK TELARs and one BUK TEL, the typical makeup of a BUK battery. More information is needed on what type of missiles are stationed at which airbase.